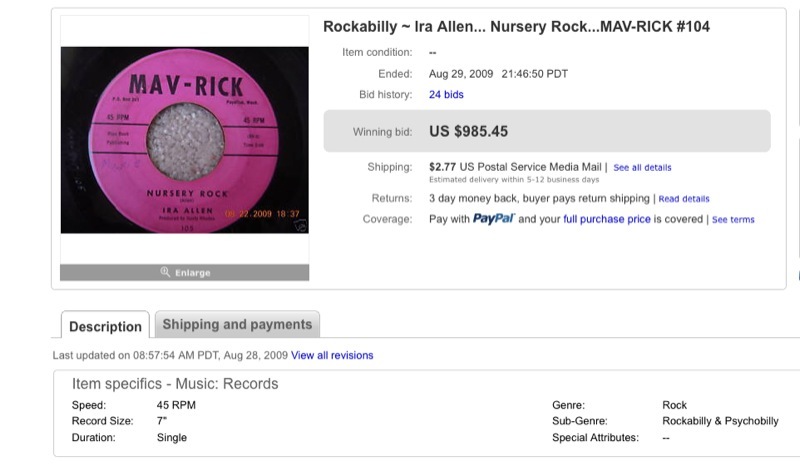 Ira Allen 45 “Nursery Rock” sells for $985.45! Oh my gosh! Buddy Mize called & told Ira to go to E-Bay – that one of his 45’s was being bid on and was up to $685.55 with more hours to bid. It apparently is from an estate sale. It is soooo exciting. 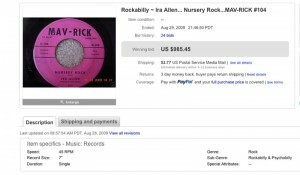 It tells that “Ira is listed in the Rockabilly Hall of Fame for his self-penned song “Nursery Rock” in 1958″ on Mav-Rick label, produced by Dusty Rhodes. The bidding started at $5.00 . We want to say thanks to the fans who are bidding it and for keeping his music alive!!!!!! See a couple of the postings of bids & record on Ira’s photos. There were 24 bids in all. The FINAL BID was $985.45).. I tried to catch it but at the last second – it faded off the screen… anyway… WHAT A DAY! To order CD’s call Judi at 615-478-4823!